Want the perfect mix of taco and salad? 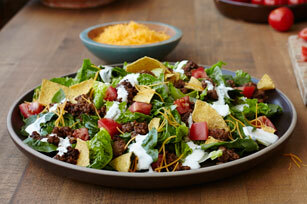 This Tangy Taco Salad is a medley of seasoned ground beef, romaine lettuce, tomatoes, feta and crushed tortilla chips. Don’t forget the drizzle of dressing to finish things off. Brown meat in large nonstick skillet on medium-high heat: drain. Return meat to skillet. Add onions; cook 5 min., stirring occasionally. Stir in seasoning mix and water. Bring to boil; simmer on medium-low heat 3 min., stirring occasionally. Place lettuce on 4 plates; top with meat mixture and remaining ingredients. Add 1 chopped avocado to the salad.